The Women's March youth branch, students from Marjory Stoneman Douglas High School — the site of the Valentine's Day attack in Parkland that killed 17 people — and a Connecticut student who lives a short drive from Sandy Hook Elementary School in Newtown, where 26 people were killed in 2012, are all working to take hold of the national conversation with a series of events. It will begin with the Women's March EMPOWER branch, which is dedicated to youth-led advocacy. The group has called for "students, teachers, school administrators, parents and allies" to take part in a national school walkout on March 14. The goal is for students and staff across the country to walk out of their classrooms for 17 minutes at 10 a.m. "to protest Congress' inaction to do more than tweet thoughts and prayers in response to the gun violence plaguing our schools and neighborhoods," the organization said in a statement. "We need action," it said. Students from Parkland, meanwhile, are organizing their own event on March 24 in Washington called the "March for Our Lives." The protest will "demand that a comprehensive and effective bill be immediately brought before Congress to address these gun issues," according to its mission statement. "No special interest group, no political agenda is more critical than timely passage of legislation to effectively address the gun violence issues that are rampant in our country." Students from Douglas High School emphasized the need for action in an interview with NBC's "Meet the Press" on Sunday. 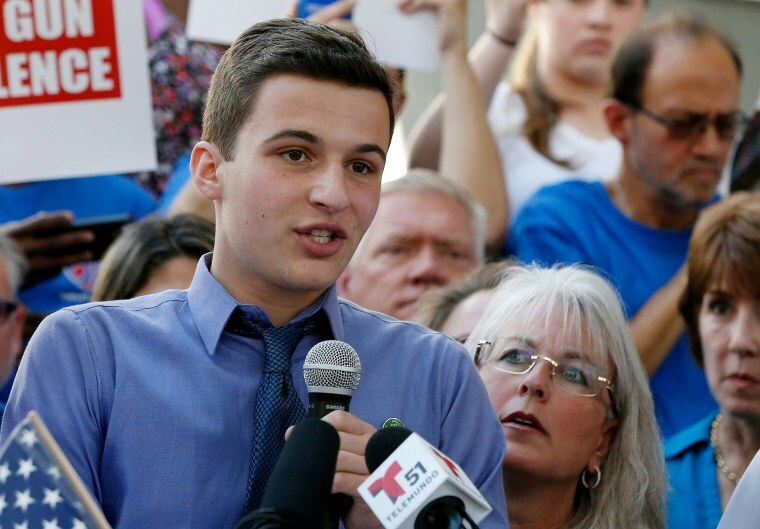 "The tragedy at Stoneman Douglas was not because of Stoneman Douglas," junior Cameron Kasky said. "It was because people like Nikolas Cruz were able to buy these weapons. "We're not going to let the 17 bullets we just took take us down," he added. "If anything, we're going to keep running and lead the rest of the nation behind us." Some Douglas students said they might not return to school until their demands are addressed. "Our community and nation have taken too many bullets to the heart, and now is the time for us to stand up," said David Hogg, a senior. "I will not feel safe going back to school myself until reasonable mental health care legislation and gun control legislation is passed." In addition to the D.C. protest, several Parkland students are also planning to march in Florida's capital, Tallahassee, this week. "One hundred of my classmates and I will be traveling to Tallahassee this Tuesday and Wednesday to speak with our State Senators and House of Representative members. We are so grateful to have this opportunity to advocate for gun control, mental health, school safety, & more," Jaclyn Corin, Douglas' junior class president, said on Twitter. Another nationwide walkout, planned by Connecticut high school student Lane Murdock, is set for April 20 — the 19th anniversary of the Columbine, Colorado, shootings, which killed 12 high school students and a teacher. Murdock said she was "unhappy" with the nation's reaction to the Parkland shootings, so she started an online petition for a national student movement. Her petition, which had garnered more than 45,000 signatures by Sunday night, asks students to "walk out of school, wear orange and protest online and in your communities," adding: "Nothing has changed since Columbine, let us start a movement that lets the government know the time for change is now." Murdock lives just 20 minutes from Sandy Hook Elementary School. "Gun violence surrounds us. I remember my first lockdown drill as a normal thing," she said. "I saw how Newtown affected so many around me, and it hurt. It hurts that a shooter can go into a school [and] kill little kids, and adults just let it fade into the background like white noise." Murdock wants to give teens, who she says aren't represented because they can't vote, a voice and a platform. "We want this day to be a visual and vocal representation of the teen population's desire to speak," she said. "At the end of the day, we're the ones who are being hurt in our schools."